I joined these leftover four patches a while ago but had no idea what to do with the block. After Christmas, I was looking for a project I could work on quickly, as all the interruptions I was sure to have would not be conducive to a more involved quilt. So, I decided to make a small wall hanging using a block I already had. This one jumped at me, and this is what I did with it. I framed it using osnaburg fabric (also spelled osnaberg...) because I liked its open weave. The embroidery sort of (I can't draw!) mimics the motif on the black floral fabric. 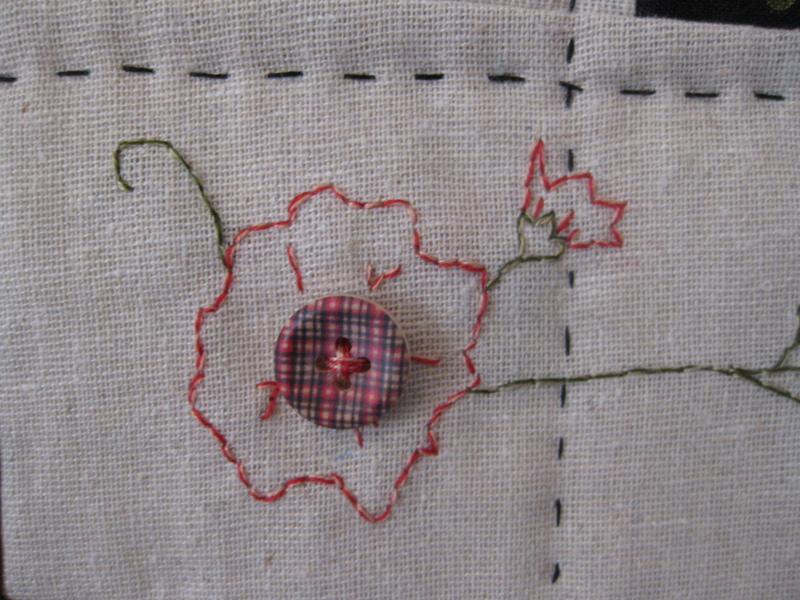 I added small buttons to the vine, emphasizing the circles on the inner border. 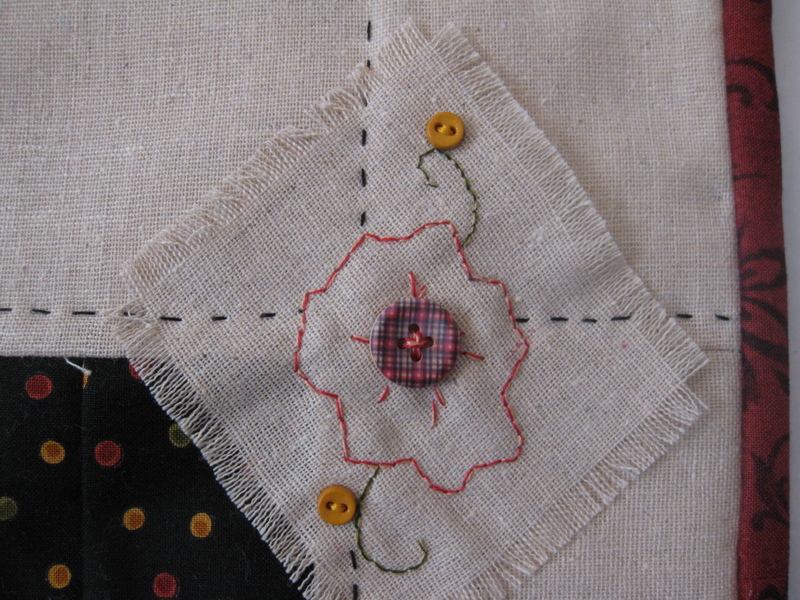 BUT, the highlight of this project for me are the buttons I got from Lots of Buttons. They are fantastic! I placed one on the center of each flower. 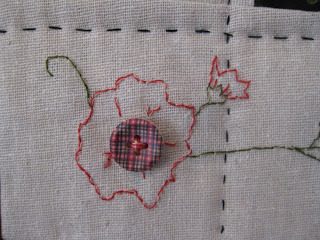 I love the button's pattern and colors, a perfect fit for this project. When I went to their website and picked these (and others which I will show you when the projects are finished), I had no idea what I was going to do with them. Speaking of Lots of Buttons, have you ever seen their site? They have an amazing selection of synthetic, wood, metal, horn and other buttons, and their prices are very competitive. 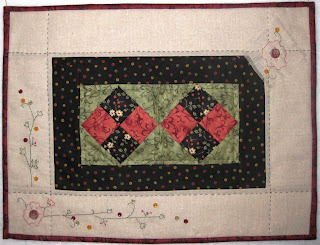 I hand quilted around the inner border using Presencia # 16 thread. 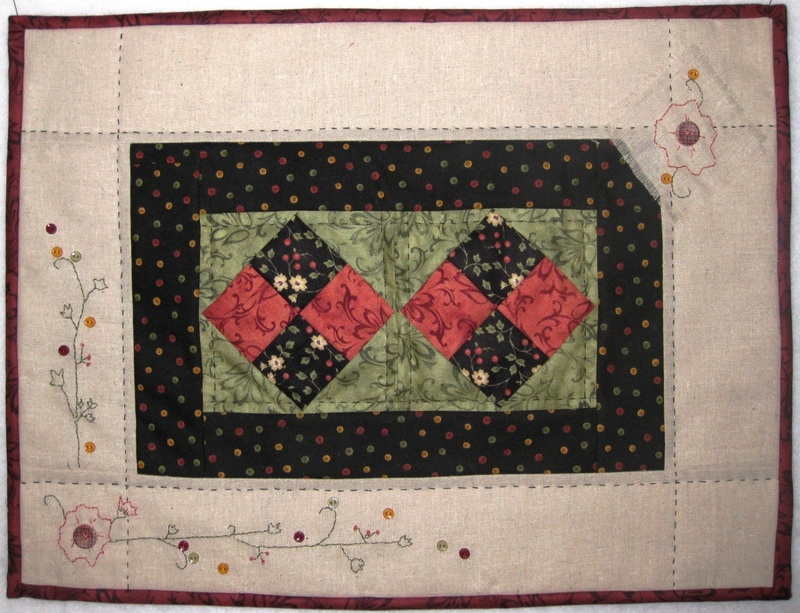 It was the first time I hand quilted using large stitches and thick thread, and am pleased with its effect on the project. What do you do with orphan blocks??? I would love to hear from you, as I still have a few I could turn into something fun! This is just adorable! All of your finishing touches add so much. Osnaburg is great for embroidery isn't it? I love what you did with the orphans. Very pretty.